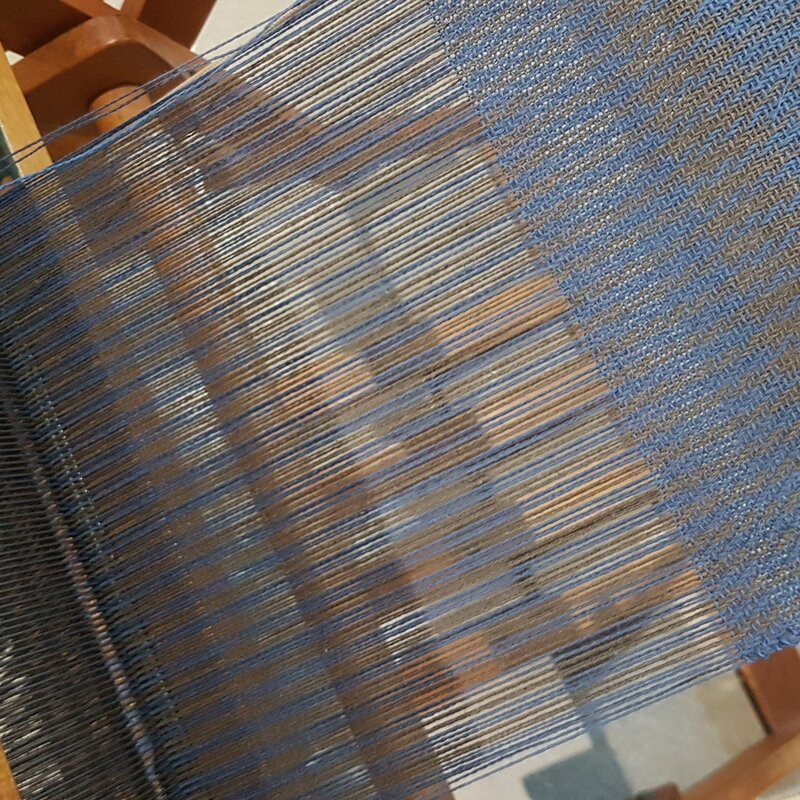 After completing the linen and lace course with Kay Faulkner I felt confident and eager to get started on a project I had put on the Dorset loom over the Christmas break, an Atwater Bronson table runner in 3/2 cotton. Working in the coarser 3/2 cotton was a joy because it was easy to spot and correct mistakes. It was also good to be working with a coloured yarn. The finer white linen we used during the course added another little hurdle for a beginner such as myself as errors were tricky to spot. Weaving in my own space, at my own pace further helped to reduce the error rate. I made two runners, one following faithfully the project instructions in Pattie Graver’s Next Steps in Weaving and the other to my own design. The projects in the Next Steps book are particularly well described and tell you everything you need to know, such as sett, width in the reed etc in a way where you can find the essential information quickly, without having waste energy scanning the text. I do recommend the book for anyone beginning their weaving journey, as I am. One of my guild friends is moving house and decluttering. Somehow we got to talking about that and she asked if I might be interested in buying her folding loom. I didn’t have to think long about that one as I have coveted her loom (in the nicest possible way) when she has brought it to guild workshops. She seemed so comfortable and self sufficient sitting at her fold up loom while the rest of us cramped each other’s style and gave ourselves shoulder fatigue with our table looms all in a row. Now that beautiful loom is mine. I thought it might be a Dorset, make in New England, USA and an application of Scandinavian oil to the wood over the Easter holiday confirmed that. The Dorset name was stamped into the wood under the raddle. I think the raddle storage position on top of the castle is an innovation from my friend’s engineer husband, who like my beloved, is an enabler of her loom and yarn collecting as well as a provider of technical support. The shafts move smoothly and the folding loom is easier to transport than my Ashford table loom. I’m also really pleased to have something that was owned by my friend, as she’s a terrific person and a good weaving mentor. We haven’t been able to spend much time together yet, but I’ve offered her loom visitation rights whenever she wants. Mt first project will be two tea towels from the Ann Field book. The Ashford table loom is on notice – behave or get sent to to an online auction.